Gateway HealthSMis a nationally ranked managed care organization offering a variety of health plans for Medicaid and Medicare eligible individuals in Pennsylvania, Ohio, Kentucky and North Carolina. 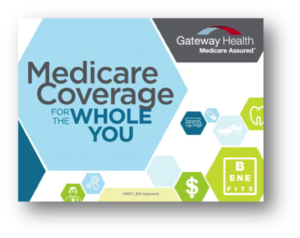 As the company continues to expand into new service areas and the competitive landscape is fiercer than ever, both internal and external sales representatives must introduce the Gateway Health Medicare AssuredSMproduct line to a growing number of potential customers, many of whom may have very little to no awareness due to its newness in some markets. Gateway Health established the Marketing Operations department to provide a higher level of support to its sales representatives. When the new Marketing Operations staff reviewed existing (past and current) materials, they determined there were plenty of available materials but no single catalogue to organize or access the various pieces and it was determined that some pieces could be consolidated. The Marketing Operations department turned to Mindful Kreative – the marketing communications partner of Gateway Health for over 10 years – to develop a new sales toolkit of marketing materials and introduce a “one-stop shop” so sales representatives could easily access everything they need, eliminating individual requests and streamlining the process. With so many competitors in the industry, Gateway Health viewed the sales toolkit as a vital piece to stand out among sales representatives, showcasing the great materials Gateway Health makes available to help sell their products. After a successful launch of the first sales toolkit, the Marketing Operations team turned to Mindful Kreative again. They wanted to continue providing a “one-stop shop” where sales representatives could customize and order marketing materials for Medicare Assured products. The new sales toolkit rollout campaign needed to “hook” the attention of sales representatives, present marketing materials in a new way, and easily showcase the resources available to support them in their sales roles. All pieces needed to be consistent and customizable, with Gateway Health branding. To improve communications between Gateway Health and its sales representatives by creating a user-friendly sales toolkit of materials. To provide ready-made materials and easy processes so sales representatives can focus on sales rather than communications. To raise awareness of the Gateway Health brand among potential Medicare consumers. To ensure more consistent messaging and design across all marketing and sales materials. To position Gateway Health as a resource and its Marketing Operations department as the go-to sales support for selling Medicare Advantage products, ultimately improving overall communications and staying top of mind when representatives present Medicare Advantage plan offerings to potential customers. Recognizing that Gateway Health’s commitment to caring for the whole person sets it apart from its competitors. We wanted the design of the sales toolkit materials to also set Gateway Health apart. Competitors often utilize photographs in their marketing communications efforts – sometimes featuring stock images other health plans are also using – so we developed several creative options with a more graphic look and feel to help Gateway Health stand out. The Marketing Operations department selected a design featuring healthcare-related icons and copy that supported the “Medicare Coverage for the Whole You” tagline presented for this campaign. The various materials were intentionally designed with the same look, feel and messaging to reinforce the Gateway Health brand among current and potential members. Almost every piece included variable fields, such as contact information, so sales representatives could personalize the materials as needed. Once the new materials had been designed and approved, we worked with Marketing Operations and a Gateway Health vendor to set up the “one stop shop” that allowed sales representatives to order the personalized materials in an efficient and cost effective manner. The toolkits needed to be introduced in a completely new, unmatched way, ultimately “hooking” the attention of sales representatives and easily showcasing the resources available to support their efforts. The aim was to present the materials in a nicely packaged and portable box – complete with a take out menu – that played off of the “Catering to Your Needs” theme. We created a full color box to house the sales toolkit materials and corresponding menu that listed all of the materials available for order. 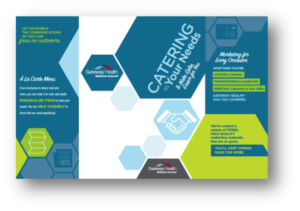 While the design mirrored the look of the sales toolkit materials, the box and menu messaging was inspired by the “Catering to Your Needs” theme. 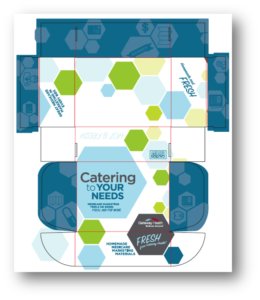 The box featured copy such as “Fresh from Gateway Health” and “Homemade Medicare Marketing Materials,” while the menu included descriptions of available materials, to reinforce the theme and encourage sales representatives to utilize this new sales toolkit. 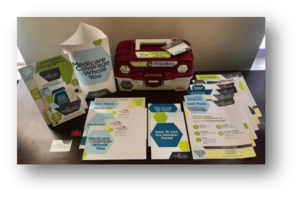 Once the concept and design were complete, we coordinated the printing and production of the sales toolkit materials, working with multiple vendors to ensure everything was delivered on time for sales toolkit assembly and completed before roll out meetings. The Mindful Kreative team spent two days assembling the sales toolkits, from building the boxes and brochure stands to carefully placing materials inside the “catering boxes” in a predetermined order, so the Marketing Operations team members could easily review everything with sales representatives during roll out meetings. These packaged boxes not only gave sales representatives a chance to see the new materials in person but also got them excited about placing orders for the AEP season. Marketing Operations hand delivered all 300 kits, explaining in detail the resources now available and how to easily obtain the various items while shopping online and using the “shopping cart” to order (check-out) what they personally needed. The sales representatives were impressed with the support shown by the new Marketing Operations team and thankful for the new materials that set them apart from competitors. We acknowledged that the packaging of the toolkit was the first thing the sales representatives would see. Due to the significant percentage of male sales representatives, we chose a theme that would resonate with the primarily male audience and make an impression when they arrived at their offices. For this reason, we chose to develop the “Let’s Go Fishing” Sales Toolkit. Other key messages like, “official fishing gear” and Medicare Assured “custom lures” were used to grab the attention of the brokers and to tie in the theme. For the quick reference guide, a piece that gives an overview of all the materials available to use for marketing, we played off of the idea of the fishing license by creating a fishing manual that someone would expect to receive with his or her license, attached to the outside of the piece. This encouraged sales representatives to cast their line wide, knowing they have the right lures, weights, bobbers and bait to get qualified leads. 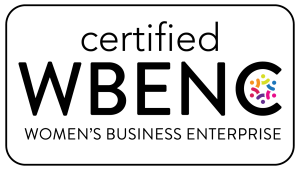 Efforts really were two-fold; There was an identified need to develop a creative package that would speak to the internal and external sales representatives, but in addition, it was important to keep in mind that the contents of the package, all the marketing materials, needed to speak to the consumer and aid in helping sales representatives present and sell Medicare Assured products. Once the concept and design were complete, we coordinated the printing, production and assembly of the sales toolkit materials, working with multiple vendors to ensure everything was delivered on time for sales toolkit assembly and completed before roll out meetings. With the completion of the toolkits, Marketing Operations team members could easily review everything with sales representatives during roll out meetings. The “Let’s Go Fishing” Sales Toolkit not only gave sales representatives a chance to see the new materials in person but also differentiated Gateway Health among competitors. When revealed, sales representatives were excited about placing orders for the AEP season and selling Gateway Health Medicare Assured plans, knowing they have the right tools and support in place to succeed. The initial response to our efforts was overwhelmingly positive. 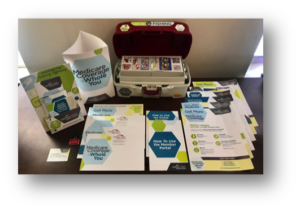 Anecdotally, the Marketing Operations department voiced how impressed they were with the look, feel and messaging of the various sales toolkit materials. Additionally, the sales representatives stated the roll out meetings confirmed that the Marketing Operations team was there to provide ongoing marketing support so they could focus on consumers. Due to the success of the sales toolkit and online ordering site during a three-month period, 71,882 pieces were ordered for sales support. Working with a network of 1,278 brokers, in addition to internal sales representatives, 605 individual orders were placed during the AEP season. Additionally, due to more focused, consistent efforts, production costs decreased and messaging provided to be more concise and pointed drawing in more leads than in previous years. As a direct result of the “Let’s Go Fishing” sales toolkit and online ordering site, 224,803 pieces were ordered for sales support. Additionally, due to more focused, consistent efforts, production costs decreased by nearly 25% and messaging provided to be more concise and pointed drawing in more qualified leads than in previous years. In previous years, the sales team had 3,500 leads during the AEP season, converting to 331 applications for membership or new members. The following year, the sales team had 7,400 leads during the AEP season, converting to 929 applications or new members. Enrollment increased by 182%. When the sales toolkits were released, the sales team had 17,904 leads, converting to 7,434 applications or new members. Not only did enrollment increase, the amount of qualified leads nearly doubled at 42%. 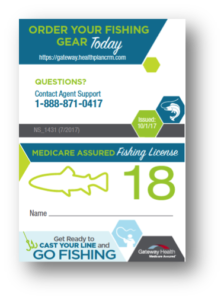 The creation of the sales toolkit and implementation of the “Catering to Your Needs” and “Let’s Go Fishing” campaigns helped to successfully improve communications between Gateway Health and its sales representatives. In fact, sales representatives continue to reach out to the Marketing Operations department with ideas for new materials to add to the sales toolkit to meet their evolving needs. We continue to help with the development of additional materials as needed to ensure more consistent messaging and design across all marketing and sales materials.